"Not many authors write a book in nine days, and fewer still are likely to announce it in the prologue. 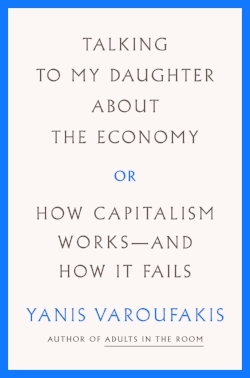 Yanis Varoufakis has no qualms about doing so in this brief history of capitalism, structured around the device of talking to his daughter, Xenia, not long a teenager. It was first published a few years ago, when she was even younger, and has been updated for British readers following a further week’s writing. By being open about the writing process, the scholar and politician manages his readers’ expectations; but he also builds them, by promising to explain economics in a language that everyone can understand, in place of the jargon- infested pseudo-scientific language of mainstream economics. ...."